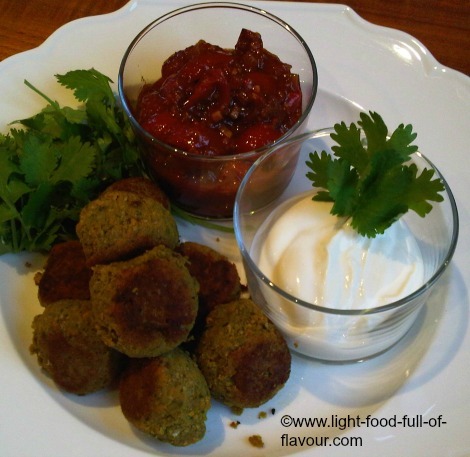 Do try these Indian falafels of mine - they take a bit of time to make but they are super delicious and worth every minute of work that you put in. I decided to flavour the falafels with garam masala, which is a warm spice blend rather than a fiery one. There is no one single recipe for a garam masala blend – the recipes vary from region to region in India, and quite often from family to family. I’ve used a ready-made garam masala blend in this recipe and have combined it with some turmeric (if you add too much of turmeric it can make a dish bitter). Turmeric is a spice though, with a lot of medicinal benefits. I like to serve these Indian falafels together with lots of rocket and coriander leaves, my tomato chilli jam and natural, Greek-style yogurt. If you want a more substantial meal, serve it with toasted pitta bread as well. 1. Heat a tablespoon of oil in a frying pan. Add the chopped onion and cook, stirring, over a medium heat for 5 minutes. Add the spices, stir and cook for a further minute. Remove the frying pan from the heat and let the spiced onions cool down to room temperature. 2. Place the grated sweet potato or butternut squash, spiced onions, fresh coriander (cilantro), chickpeas, breadcrumbs and egg in a food processor. Season with salt and pepper and pulse to a coarse paste. 3. Form 20 walnut-size balls with your hands and place them on a tray. Place the tray in the fridge and chill for 30 minutes. 4. Preheat the oven to 200C/fan 180C/400F/gas mark 6. 5. Remove the falafels from the fridge. Cover a baking tray with baking parchment. Heat the remaining oil in a frying pan and quickly fry the falafels over a medium high heat until they are brown all over. Depending on the size of your frying pan, you may have to do this in batches. Place the falafels on the baking tray, place the tray in the oven and cook for 10 minutes until they are cooked through.